The representatives of the Russian Investment Agency “Invest in Russia” took part in the meeting of the Coordination Council of the Investment of the Ministry of Transport of the Russian Federation. 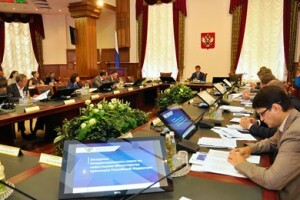 On July 16, 2014, the representatives of the Russian Investment Agency “Invest in Russia” took part in the meeting of the Coordination Council of the Investment of the Ministry of Transport of the Russian Federation. It is planned that the Coordinating Council will be a platform to discuss issues related to attracting investment for the development of transport infrastructure. Among these issues, the Minister of Transport highlighted the removal of restrictions in the area of taxation, the definition of the key parameters of efficiency of investment projects, improvement of public-private partnership (PPP), as well as a number of other tasks. 2015 © "INVEST IN RUSSIA" - Russian Investment Agency.